Hopefully this will be one of the last beginning of semester reminders to my dear friends reading this to expect little for posts. I may yet graduate. I'm taking thirteen hours, working four or five days a week and trying to make it to ballet. I took three hours of ballet this past wednesday and it was killer. Learned a lot from Diane about Pointe, but school the next morning with all of its walking and flights of stairs was about the death of me. Despite all this, and the wedding planning, I still feel like I need to do more. My career is in a different place than it was when I went back to school after Katrina, unemployed, off of a two year not-well-paid consultant's gig, still doing a lot of sysadmin. I've really fallen into programming, debugging, fixing things - I still have some sysadmin work but I turn down offers for it otherwise, being responsible for one company's servers' wellbeing is enough. I want to build something of my own but what I find that I'm best at is taking things apart. I discovered taking Golden's Reversing class in the spring that I do still like security - I just hate policy work and securing systems, which is what security work consists of down here for independents other than some forensics, which I haven't done any of. I suppose I will leave this open ended, as to where to go from here? 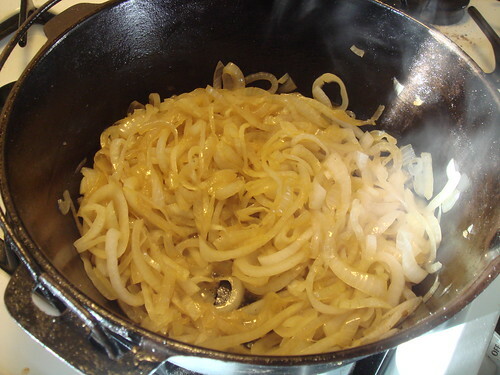 cast iron onions, originally uploaded by candice quates. This is actually just one onion. a one pound, five ounce onion, mind you. This is my great-grandmother's cast iron dutch oven. I hope to see this pot's 100th birthday. I estimate it and it's sister, a no.5 cast iron frying pan to be 80-something. My next oldest pans are in their 60s, I think.